Hi there and welcome to Day 3 of my Growing in Unity week! I've loved coloring glass images for years so I was head over heels when I saw this stamp a while back. If I'd really gotten into it, I would have done the refracted image on the table in front of the bottles but I stopped while I was ahead. I hope you'll visit again tomorrow. Don't forget to leave a comment to have a chance at a great Unity prize at the end of the week. Hi Jen! Congrats on being Guest Designer for Unity Stamps. I LOVE their stamps. You did a great job coloring the jars-very cute! I live pretty close to Winston. We're almost neighbors! (Martinsville, VA) Have a blessed day! Great job on this colorful array of bottles! This is a awesome job of coloring. The detail is great. Love the clean lines. I love the way you colored the bottles! Very fun and cheery card with the bright colors! Love the bright, cheery colors! PS. How do you do refractive? 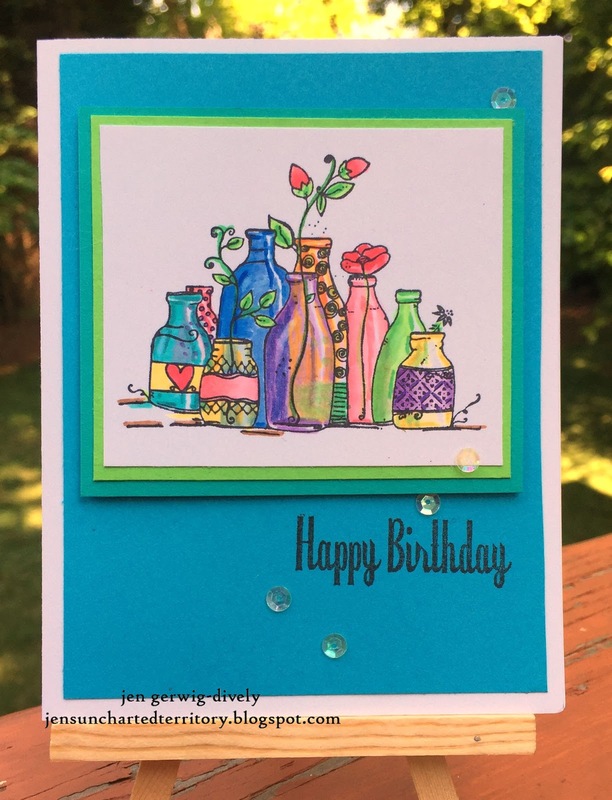 beautiful card.. love your coloring of glass... very beautiful..
What a terrific job you do at coloring glass! Lovely bottles,they look so colorful,nice,fabulous and terrific.Thanks for sharing. I love this stamp, too...how do you color your glass? I've only ever used watercolors on mine but love your look! No wonder you're a guest designer! Love the grouping. The coloring is great. Wonderful colors on your card today! Lovely card. Love this image. Ooooh, I like this. Lovely colors. Nice, bright colors. Good job. Love all the colors! Beautiful, and the sequins are a wonderful accent! I think it's pretty just how it is - great job!